The Living Conditions Survey (LCS) is part of Stats SA’s household survey programme and provides detailed information on households’ living circumstances, as well as their income and expenditure patterns. Information from this survey was used to compile the report Men, Women and Children: Findings of the Living Conditions Survey 2014/15. Let’s take a look at some of the findings outlined in the report. The provinces with the highest headcount of adult poverty are Limpopo (67,5%), Eastern Cape (67,3%), KwaZulu-Natal (60,7%) and North West (59,6%). For these four provinces, significantly more than half of their population were living in poverty. 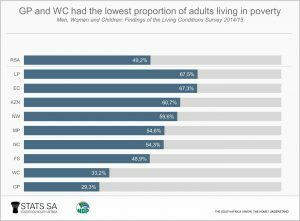 Gauteng and Western Cape had the lowest proportion of adults living in poverty at 29,3% and 33,2%, respectively. According to the LCS 2014/15, approximately 40,0% of South Africans were living below the UBPL. The poverty gap (the distance away from the poverty line) and severity of poverty measures were larger for female-headed households compared to households headed by males. The proportion of females living below the UBPL was 16,9 percentage points more than that of households headed by males (49,9% versus 33,0%). Almost six out of every ten households headed by males (59,3%) compared to over seven out of every ten households headed by females (74,8%) in traditional areas were living under the UBPL. For the full report, download the Men, Women and Children: Findings of the Living Conditions Survey 2014/15 here.